this busy city give yourself at least four days to see and visit all that it has to offer. Here are some view of places I visited during my last two days in this huge city. I started one morning by visitig the Shanghai Art Museum. A new structure, it contains an incredible collection of art and works dating back to China's Bronze Age. An incredible collectio of Ming era pottery and ceramics. After vistiing the museum I walked and look for Mao Zedong's former Shanghai residence. I did find it but as luck would have it, the residence was closed on Monday. Apparently Mao lived here with his family in the 1920s. Other notable figures in recent Chinese history that had residences in Shanghai were Chou En-Lai as well as Sun-Yatzen. Following the signs and asking policemen and streetworks were the house was I finally found it; closed! The temperature at 10:00am was 86 degree plus. It would get hotter that day. My exploring took me through Nanjing Road pedetrian walkway. This is the the shopping mall of Shanghai. old town Shanghai shops and eaterys. As evening fell a waxing moon appeared in the western over Nanjing Road. Over on the Bund a statue of Mao seemed to be having the last laugh as China has become the major producer of consumerable items these days. With such a larger city to cover I had to decide what I really wanted to see and where I wanted to go without killing myself getting there. 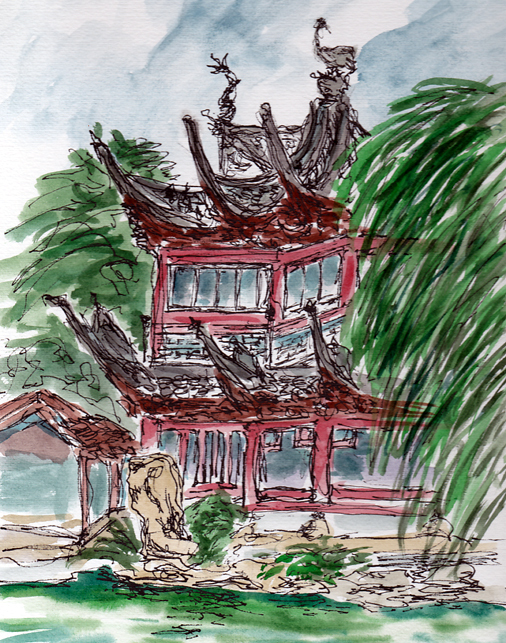 In the Old Shanghai area is the typical tourist trap area and a place known as Yuyuan Gardens. The gardens were build in 1559 during the Ming Dynasty. The centerpiece of the garden is a 5 ton boulder that was suppose to go to the palace in Beijing but was lost when the ship carrying it sank off the coast near Shanghai. After being salvaged the stone found its way to its curren location in the garden. However, the garden has not always been a peaceful place. 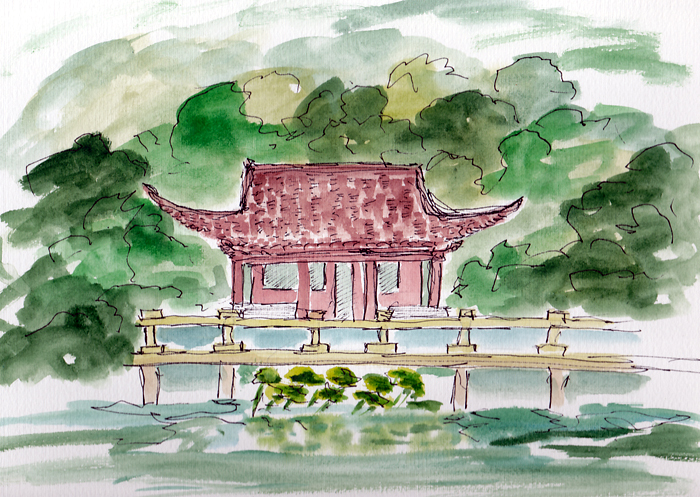 The Huixiting Teahouse was used by the British during the First Opium War. Other buildlings on the grounds have been headquarters for various factions during the Taipei Rebellion and even the Japanese invasion of China in the 1930s. The five acre area is divided by walls which are known as "Dragon Walls." Each of the walls has a dragon head and undulating tiles which represent a dragons body. One of the six Dragon Walls. Diachun Hall, headquarters during the Taipei Rebellion. One of the Dragon Walls. My rendition of Diachun Hall. My rendition of the Nine Lion Study. You never know what you will find in Shanghai. How about tanks and airplanes made from spent cartridges! My last morning walk along the Bund revealed a walkway with hardly any people. Where had everyone gone? The fashion photographers were out early too. Of course, I still had to get back to the hotel in one piece and with the Shanghai pedestrian having no right-of-way, I almost got hit by this guy in front of the hotel. He's giving me that "why were you walking in front of me look." A few hours later I was Pudong Airport waiting for my flight back to the U.S.
My three weeks in China were full of surprises, some expected and other unusual. I have no idea how many times I was photographed with families. Everyone wants to have a picture of themselves with a foreigner. Here I am with a man and his grandson that sat next to me while I was painting the Pudong Skyline. My teacher students were great and the hosts in Dagang kept us happy. People were friendly and everyone seemed to know "hello." I responded with "ni hao ma" and "shey shey ni" (thank you very much) and folks always smiled back. Tips are not expected and you can always expect hot water for tea at every meal. My only recommendation for visiting China is go during the Fall or Spring. Summers are hot and humid and winters are cold. Aside from that think about taking a trip to the Middle Kingdom. Here is a student who wanted his picture taken with an artist. Come back next week for more of my "Bicycles of China" photo essay.